Parents, educators and community members often want to know what progress our students are making and what we focus on and prioritize as a district. The Supporting All Learners 2018 document, which will become an annual learning report, identifies district priorities and measures the progress we have made in achieving these priorities. 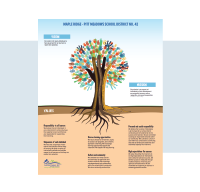 In this report, you will learn about a school in which teachers take a comprehensive, collaborative, and research-based approach to helping students improve their literacy skills. You will learn that this approach is well-supported not only by the school district but also through community structures and systems that we have developed, carefully and deliberately, over the course of several years. A listing of collections of personal information maintained by School District No. 42. This directory is prepared pursuant to the Freedom of Information and Protection of Privacy Act, Section 69. 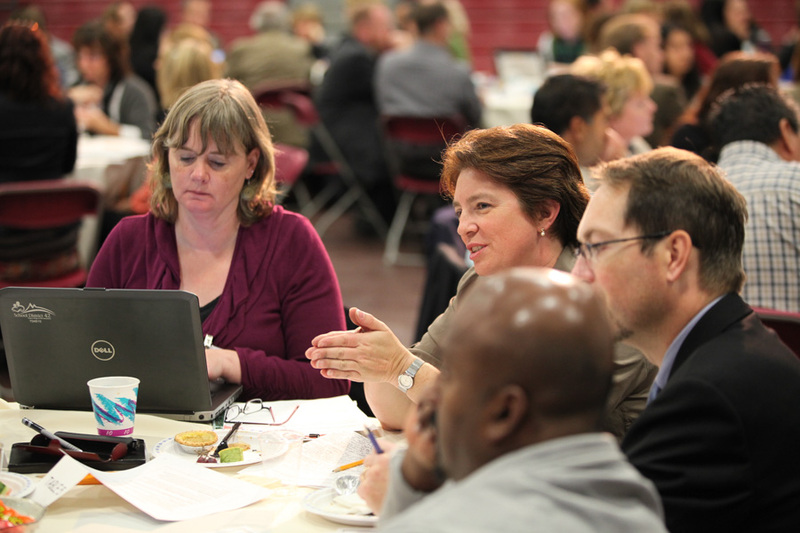 On November 16, 2010 more than 200 parents, students, trustees, educators and business and civic leaders met in the rotunda at Thomas Haney Centre to participate in a conversation that will help shape the future of learning in our community. Ken Robinson, an internationally-renowned expert in the field of creativity and innovation in business and education, summarizes the issues in this video clip. What did the forum participants say? Basic skills such as multiplication are still important but memorization is irrelevant unless the old information can be used in new ways. Brains are changing. Our kids live in the age of mass distractions. We need to teach the skill of filtering information and making the right choices. Maybe we will have a new ‘renaissance’ where understanding the big ideas from a wide range of areas will be the definition of being educated. We need to present learning in a variety of ways and allow students to present their learning in a style suited to them. The most important skills for the future will be being resourceful and thinking critically. Challenging tasks that made it feel like the topic mattered. Learning needs to be relevant and engaging. A teacher who is excited. When teachers are passionate, it makes the students want to learn more about it. Something that you could personally connect to or that someone has made personal for you. Building relationships and connections with one another. Working with a group of people believing in the same cause, or learning the same thing. Teachers must connect with kids on their own terms and get to know their common interests. Powerful learning involves choice, interaction, and engagement. And it needs to involve interactive problem solving with real life scenarios. Learning happens anywhere, including from home. If learning can happen anywhere perhaps the school becomes the network rather than the site. Schools should be structured around learning cohorts based on supportive environments and common interests rather than age or grade. Subjects should be integrated and students should work independently or in groups on projects. Students should have opportunities to design projects and work together to solve problems. Learning needs to involve everyone – students, teachers, parents, all learning from each other. Technology should allow us to individualize education for each child resulting in more engagement and interest. On Monday, April, 29, 2013, the six school districts comprising the Fraser Valley region of the BC School Superintendents Association (Fraser/Cascade, Langley, Abbotsford, Maple Ridge/Pitt Meadows, Chilliwack, Mission) provided an opportunity for 175 student representatives to discuss three key questions about the future of education. What changes in schools do you think need to be put in place in order to better serve students in the future? What classroom changes do you think need to be put in place in order to better serve students in the future? What types of things get you personally engaged as a learner? The summary report below provides a synopsis of the day’s proceedings and an analysis of the students’ responses. It is intended to contribute the student voice to the dialogue around future directions for education in British Columbia, and to help engage school staff in planning for growth, change and improvement. On October 25, 2012 more than 250 parents, students, teachers, support staff, school administrators and community members participated in a Ministry forum to help inform the development of future requirements for British Columbia high school graduation. The six school districts in the region, Abbotsford, Chilliwack, Fraser-Cascade, Langley, Maple Ridge/Pitt Meadows and Mission were represented. Download our report to learn more about this forum.